By now, all of us fans of Assassins Creed have learned about and seen the newest protagonist – featured in the upcoming Assassins Creed Origins – named Bayek. We also know that previous Assassins Creed stories have included supporting characters with whom the main protagonist builds a strong relationship, some of whom have become fan favorites (RIP, Yusuf Tazim). However, these supporting characters have always been non-player characters (NPCs), and used solely as plot points and story devices. As it stands, only a few things about Aya’s part in the story have been revealed so far. We know that she is a native of Alexandria, and that she moved to the village of Siwa when she was young. Presumably, this is where she met Bayek, as the story states that the two grew up together. 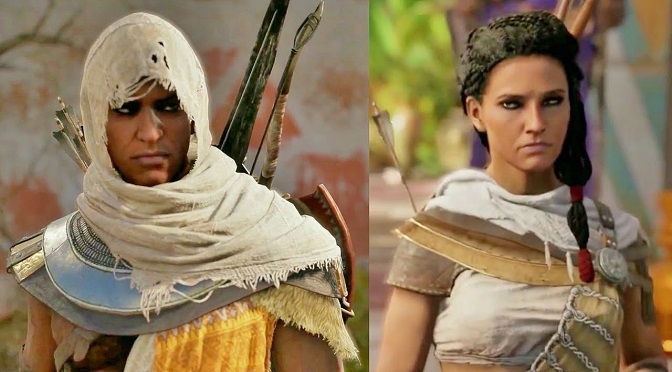 We also know that Aya and Bayek trained together as they were growing up, but that she is not a Medjay (we talked about Bayek being a Medjay in an earlier article). It has also been revealed that Aya believes very strongly in Cleopatra as a leader, and that Aya will play a heavy part in introducing Bayek to Cleopatra. While Bayek does believe in the future queen, there will be some disagreements between him, Aya, and Cleopatra throughout the story. Finally, we know that Bayek and Aya’s union is what will ultimately give life to the Assassin Order. As we said earlier, Aya is not the only other playable character in Assassins Creed Origins. While game director Ashraf Ismail has said that the team is not yet revealing the identities of the other playable characters (or how they will play), we do know that they will only be playable in certain missions. It’s also a good bet that they will not be as skilled as Bayek, so as to not lessen his appeal or importance to the story. He IS the progenitor of the Assassin Order, after all. Assassins Creed Origins will be available on October 27, 2017 for PS4, PC, and Xbox One. What do you hope to see from more playable characters in Assassins Creed Origins, dear readers? How do you think Aya will factor in to the story? Let us know your thoughts in the comments below!